A special interview with Nasu Kinoko from TYPE-MOON Ace 2, which was released on January 21st, 2009. The interview focuses on TYPE-MOON and its new game, Mahoutsukai no Yoru, and touches on the game's birth, production, content, and future. NASU Kinoko is the script writer for all of TYPE-MOON's works, and has also published his own work, including the novels Kara no Kyoukai and DDD. They say Mahoutsukai no Yoru was adapted from a novel written by Mr. Nasu. When was the original work written? 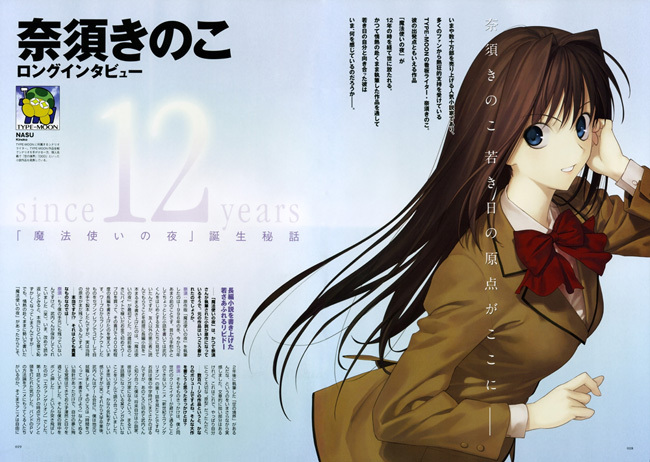 Nasu: The original version of Mahoutsukai no Yoru was written in the winter of 1996, 12 years ago. 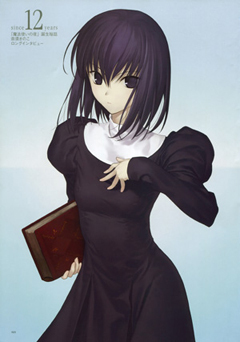 The novel Mahoutsukai no Yoru was completed with the intent of being shown to people other than my friends, and later passed around and read by my circle of friends such as Takeuchi-kun. At the time I was around 20, I used my own salary to buy my first word processor. I remember being so happy at the time that I wrote a long story of around 400 pages on the spur of the moment. I typed the story with the word processor, then printed it in a convenience store and binded it together myself, actually, the original copy still exists. Really? Wouldn't that make it extremely precious? Nasu: Even though I no longer have it, Takeuchi-kun is still preserving it for me (laughs). Reading it now, I'm ashamed to say that the writing is very bad... but at the same time I think it was because of the Mahoutsukai no Yoru that was written on the spur of the moment that Kara no Kyoukai was written 2 years later. Although there are problems with the level of writing, this is also a very important "prototype" for me. Hundreds of pages of writing are already a lot of text. What made you want to work on such a large project? Nasu: Overall, the cause was because of watching the first episode of Neon Genesis Evangelion, which can't have been ignored by neither I nor my contemporaries. The story goes back to my high school days, where I met Takeuchi-kun. At the time I announced that I will become a novelist in the future, and Takeuchi-kun said he will become a manga artist, this was like the plot of some popular manga, and in reality we talked to each other quite a bit. Thinking back on it now, it was pretty embarrassing (laughs). Since then, we both graduated from college, Takeuchi-kun went to work at a game company, and I found a local job. I had the casual goal of "finding some time to write a novel," and I didn't notice my dream was slowly being buried while I lived idly as the day by day. Neon Genesis Evangelion was what gave me a big push in the back... or should I say kicked me and sent me flying. Not even the first episode itself, I felt my brain had been smacked hard after just watching the opening theme. My heart thought, how can someone think to bring the PV (Promotion Video) method to anime? How ideas can be expressed so freely in anime? "If there are people in this world who are so ahead of the rest, what am I still being confused about?" My heart was severely shocked. I supposed Eva has the charm and enthusiasm that makes people think "I have to do something." I'm sure of it. Instead of idly saying "when I have time next time," I should at least write something. And so, the result of this sudden momentum was Mahoutsukai no Yoru. What did you do with the completed work? Nasu: Trying to enter several competition of course, but in the end it ended up being something passed around by friends. Back then I planned to submit the work to Fujimi Shobo. It was mainly because I liked Kouichirou Yonemura-sensei's Hourai Gakuen series. And then, I let my recklessly kept writing without paying attention to the page limit, and later gave up submitting my work after realizing there was no way I could keep the story under 350 pages. The second year, I told myself all I need is to keep the number of pages within the limit. The following year, even though I wrote with the intention of reaching Yonemura once again, when I noticed, I already had over 500 pages... and so I realized there was no way I could write works that are under the page limits (laughs). Becoming clearly aware of my own weak points, I was very disappointed. Thinking back on it now, that was a very good thing. When you're 20 years old, you won't die if you failed to submit your manuscript, and after many ups and downs I finally formed "TYPE-MOON" with Takeuchi-kun. In other words, everything that the young Nasu who wanted to become a novelist wanted to do was included in Mahoutsukai no Yoru? Nasu: That's right. Because of this, reading it now, I feel very embarrassed, but at the same time also very envious. I was so pure (laughs). What is your impression after reading your writings from 12 years ago? Nasu: Putting aside the story, the technical side is pretty immature, and I felt nervous reading it. This was a work that was ready for submission! (laughs). The essence of a work's subject and content is like a person's backbone, it's enough as long as only those who read it carefully can understand. To write for entertainment, such as those with rich content and fashion, with brighter parts appearing before plot developments... this became my style after finishing Kara no Kyoukai. Mahoutsukai no Yoru is something without any of that decoration, and presents its main point in the very beginning. Looking at it, I can only laugh and tell myself "Ah, this is really embarrassing" (laughs). In any case, those parts will be removed or sealed away in the remake, and be recreated from scratch. Using the work by "Nasu from '96" as the foundation, after 12 years of growth and finally obtaining the "Nasu from 2009," using styles acceptable by the gamers to present the work to the world is one of the ideas for the development of the game. Does this mean a lot of effort was be spent in remaking it? Nasu: Since I thought it was only going to be a matter of applying some changes to the original work, I original estimated it was only going to take a month, but in the end it took half a year. It was like trying to preserve the interesting parts from the past while adding in new things on top of the old foundation. It was much faster to start from zero. Actually, for something totally new, the faster I write it, the faster it'll get done, but I also needed to preserve the feelings from back then, otherwise the reasons for digging out Mahoutsukai no Yoru would be lost. When reading the original script, I would often think "the current me would never write this line." But to preserve the theme from back then, I even tried to keep the atmosphere related to the each character's lines. Aoko and Alice didn't change much, but Soujuurou's appearance changed quite a bit, so he'll be somewhat different from the original. It's amazing to be able to create a female protagonist who can be used both 12 years ago and now. Nasu: Stop flattering me. Nowadays the word "tsundere" has already taken root in her character... or you could say it's already an old habit. However, female protagonist with a tough side as well as a cute side has been one of Japan's cultural traditions since ancient times. Japan has been a treasure chest of tsundere and yandere since ancient times (laughs). After 12 years, the reason to release a remake of Mahoutsukai no Yoru on the PC is? Nasu: Takeuchi-kun once told me he wanted to release a new work before Girls' Work is finished, but at the time I only had DDD in my head, and can't think up anything else. I'm already working on DDD, which I wanted to do, and Girls' Work, something that has a totally different focus, is also being worked on... after thinking about it for 3 months, still no satisfactory plan for "releasing a game during this time" appeared. It can't be full of interesting things like DDD, it can't take on a completely new direction like Girls' Work, and it also can't be overly dominant like Fate... but if we create something without any plans, it'll likely turn into a lesser version of DDD. Under these conditions, Takeuchi-kun suggested "how about remaking Mahoutsukai no Yoru?" Under normal circumstances I would be strongly against this, but after asking Takeuchi-kun what he wants to do, he answered: "Of course I would die to do the art, but if we always work like this, even if we finish it, the end result won't bring a sense of awe. To not disappoint the players, and in pursuit of something new, I will leave the art to Mr. Koyama." If Takeuchi-kun, being the person who loves Mahoutsukai no Yoru the most in the world, was willing to go this far, I felt I can't push it off any more. Also, Mahoutsukai no Yoru is also very different from the three titles mentioned previously. It's the correct choice! ...And so I accepted the idea. Thinking about it now, I might have completely and utterly fell into a trap. Just think of it as continuously chasing after new things, constantly accepting challenges. However, it probably requires quite a bit of courage to take out your debut work from 12 years ago and show it to the world? Nasu: Indeed, it's like being embarrassed about showing old picture albums. At the same time there's also a feeling of unrest, worrying that people are interested in a completely new work instead a remake. However, it's also very interesting to be releasing Mahoutsukai no Yoru at this time. If Girls' Work represents the future, Mahoutsukai no Yoru is the story that serves to bring back nostalgic memories. There are players who enjoy the old, familiar feeling and others who enjoy something completely new. I can also try to face the old me. Feelings like, that's right, there was no convenience store that open 24 hours back then. While revising the old text can be very hard, there were also some new surprises, so I was pretty happy. When did you start considering the work's publication? Nasu: No, never considered it. Not even have I never considered it, because there were never plans to publish Mahoutsukai no Yoru, all the scenarios from the story, such as living with female mages, battles and chases in the school ground, and tactical meetings on the school roof, were all used in Fate. Some of Aoko's personality was also used to create the character of Rin. As a result, all of these can't be used for the remake of Mahoutsukai no Yoru, meaning we have to come up with new things. While the content is consistent with my current style and contains plenty gorgeous scenes, the deeper meanings and theme will stay the same. I feel that the Cobalt Bunko atmosphere found in Himuro Saeko's Zakkyo Jidai, Koisuru Onnatachi, and Clara Hakusho, something that I admired 12 years ago, has been perfectly preserved. The novel from 12 years ago didn't have many illustrations, right? Nasu: Actually, a long time ago when Takeuchi-kun was creating his personal website, he uploaded drawings of important characters starting with Aoko. Maybe at some point in time someone could come across these rare illustrations. Did any settings change compared to back then? Nasu: Regarding Aoko and Alice, because their designs appeared in TYPE-MOON's Character Material, nothing much was changed, not counting the fact that Takeuchi's drawing skills have improved since then. However, Soujuurou saw some major changes. The original character used to be a "gloomy," "naïve," "expressionless, good-looking young man. Mr. Koyama suggested a new character for Soujuurou. After a long and troublesome discussion between me, Takeuchi-kun, and Mr. Koyama, and through Mr. Koyama's suggestion, Soujuurou became someone who is closer to a normal male student. What does Mr. Nasu think about the attention this work is getting being the first title where the artist is Hirokazu Koyama? Nasu: Because we have already collaborated on DDD, there isn't anything that stood out in particular. Though to tell the truth, one area that I was a bit pressured by was if my writing could fully flesh out Mr. Koyama's excellent illustrations. Since I've known Takeuchi-kun for a long time, his illustrations and my writing style fit together very well, and we work well together as a team as well. But how should I draw out the unique charm of Mr. Koyama's illustrations through my writings, is something I'm still trying to improve upon. Since I have no problems with Mr. Koyama's drawings, his illustrations have that unique charm, and every time he finishes a new illustration, I would always go "Oh yeah" and smile to myself. Regarding the story, please give us some information within what you're allowed to say. Nasu: While I can't talk about the story in detail, it's a story about a boy from outside the city living together with two mysterious girls. There are “Boy meets Girl” elements in there; the main point is about our youth that has been long forgotten. The backdrop is a time like now, with recession after recession, when nothing is certain, although there is little hope, not all is despair; it's about a story that takes place in such interesting period. The story takes place in 1989, exactly 20 years ago. Nasu: Actually, the original story took place in 1980, a time of "Check it out Soujuurou! The neighboring town built a convenience store!!" "What's a convenience store?" (laughs). The reason for the change in time was mainly to preserve continuity with other TYPE-MOON games. Thinking of Aoko's age in Melty Blood, if we want to have her age make sense, the story has to take place in 1989. Even so, the Japan from 20 years ago is still a mysterious place for younger gamers, so I think they should have fun playing it. A weak economy due to the economic bubble, very few people with cell phones, no Internet. They can see a lifestyle totally different from today's. I also felt like I went back to 20 years ago while working on it. In one scene, someone suddenly fainted while on the phone, the other one tried to call for an ambulance by hanging up, but since the other person didn't hang up, the line is still connected to the phone of one who fainted... things like this. Surprised? Things like that really happened, like that (laughs). Just like that, even after fixing some parts that made no sense due to being too old, there are still feelings of leaping across time. The stage is very unique, and a lot of work went into drawing the background as well. Nasu: That's correct. We don't want players to feel the setting is unpolished no matter how far back it's set. The goal is to have the player should feel "I want to live in this city," to paint a memorable and beautiful street scene. Actually the setting is Tsukihime's Misaki Town, Tsukihime fans should be able to recognize locations such as the grilled beef restaurant Dai Teito. The Kuonji household has the same location as Tohno household from Tsukihime. Sharing the same setting as Tsukihime would mean fans will be able to pick out references everywhere. Nasu: Three heroes living a life full of danger and risks together. Please tell us about the three main characters. Nasu: I'll start with Aoko. A lively, logical, and strong girl. Similar to Rin from Fate, Azaka from Kara no Kyoukai, and Akiha from Tsukihime. This type of strong-willed girl appears in all TYPE-MOON games. The Aoko who appeared in Tsukihime and Melty Blood is "Aoko-sensei," not Aoko. "Aoko-sensei" is a character that appears after the main character graduats from the most important period of a person's life, and begin to develop as an adult. Think of it as a character equivalent to Touko in Kara no Kyoukai. The Aoko that appears in Mahoutsukai no Yoru is quite immature both as a person and as a mage, but begins to grow up slowly in the story. Although she has a much stronger spirit compared to people her age, it also serves to disconnect her from others. After Mr. Koyoma read the original script, his opinion was to keep Takeuchi-kun's character design. As a result, the Koyoma version of Aoko was built on top of the Takeuichi version of Aoko with some details refined. Nasu: If Aoko is the witch that blends in with today's world, then Alice is the elusive witch like those found in fairytales, matching most people's vision of a witch who lives in the middle of a forest, a girl who is trying to protect something from the outside. Although she distances herself from the rest of the world, but due to Aoko's outgoing personality, she can't help but feel some connection to others. Alice is also a prototype for a typical TYPE-MOON heroine, like Tsukihime's Hisui, someone who is just barely out of reach. Alice's design didn't change match either, to sum it up in Takeuchi-kun's words: "if you like it, then draw it as you like." In Tsukihime that would be Hisui, she's his favorite, and the design was finalized in the very beginning. It's incredible to see two people so different living together. Nasu: When two people live together this is the feeling you get (laughs). Even though they live together, they're not really close friends. They don't connect well everyday life, and they're only together as two mages. Soujuurou joined in under such circumstances - as a small unit living under the same roof, it would be great when they can all live together as ideal roommates (laughs). Finally, about the last person in the triangle, Soujuurou. Nasu: A young man who had just moved from the countryside to the city. Everything in the city seems new and amazing; as a result, he also treats everything equally. No dislikes, no ideas of his own, feeling his own existence by just being there, a strange man like that. Compared to other characters in TYPE-MOON games, his is quite rare. In the three installments of Mahoutsukai no Yoru, he is a character that plays a major role in some parts. How will the three parts be organized? Nasu: The original Mahoutsukai no Yoru only contains one episode, mainly because when I finished writing it, I told myself "I'll write part two when I have settled down a bit" while at the same time writing Kara no Kyoukai. As a result part two still doesn't exist. Now that part one has been remade, it would be nice to finish part two and three as well, then it'll be a brand new work that spans over a period of 10 years. It'll be an important topic for Nasu Kinoko, but I have no idea when I'll finish it (laughs). Nasu: In terms of the main topic, I hope people will feel like they have just watched a great movie after playing the game. Tsukihime and Fate are more about projecting yourself as the heroes, seeing through the eyes of Shiki and Shirou while experiencing adventurous scenarios, where the players should feel they have played a very fun game. Mahoutsukai no Yoru is played in the third person, the players can't project themselves onto any characters. They can't place their feelings on top of a character, but instead feel happy being in the position where they can over see the complicated story between the three main characters. To be happy not only about a particular character, but about the world view, this is how I intend it to be. Does this mean Soujuurou is not the main protagonist...? Nasu: No matter how you look at it, Aoko, Alice, and Soujuurou are at the center of the story. If you really want to find a main protagonist, that would be Aoko, since the main story revolves around her. By the way, will Aoko's sister Touko make an appearance? Nasu: You could say yes, since her appearance in Kara no Kyoukai was due to a parental desire of wanting her to see more action after the unfair treatment she received in Mahoutsukai no Yoru (laughs). Also, the Koyama version of Touko is very cute. Please look forward to more information. What's the current status of the game? Nasu: Currently the script has been, for the most part, finished. Right now we're working on fine-tuning the graphics. The game's story development, the flow between scenes and events, as well as adjusting the script to the finished graphics, are all done, the rest is up to the graphics team and the and directors. Around when will the work be available? Nasu: The original plan was to release the game around the same time as when the story takes place, so the goal was to release it in the spring. But to accommodate the large changes made to the script, the time was changed by approximately half a year. I apologize to those eagerly waiting for the game. In order to make sure the game is available in September/October, the entire staff is working very hard. Please wait a little while longer. The enthusiasm for this game? Nasu: It's different from all our works up to this point. We want to show the "style of a new TYPE-MOON." Even though the Nasu Kinoko is the same Nasu Kinoko from before, but due to the change in the graphics team, it would be enough if one can get the feeling of "ah, what a different impression." Also, since it happens to be an all-ages game, one of our biggest hope is to let the younger players be able to play as well, and at the same time to pull unsuspecting youths who played it by accident to "this side of the world." Otaku is a good thing! Why do I keep talking about these things (laughs). For those who spent their youth in the late 80s, I hope they will be submersed in nostalgic memories like "Ahh, this was how it was back then." Special attentions were paid to make sure the atmosphere from back then and the game's taste were correctly portrayed. Since this game is similar to a film, a number of necessary elements were integrated into its design. What's after Mahoutsukai no Yoru? Nasu: First, I want to work on the long awaited DDD series. Aside from that, if we're lucky we'll get to work on many small jobs here and there, I guess we'll announce those when the time is right. Also, I want to complete the Tsukihime remake in its ideal form... haven't thought about what comes after that. Looking at the flow of things, we will probably work on the second episode of Mahoutsukai no Yoru, this will be a totally brand new work. Don't forget Mr. Nasu has to work on Girls' Work at the same time. Nasu: Currently Girls' Work is being developed as well. Even though I can't say much about the content, I can tell you one thing: the fact that we have such strong writer gives me great excitement and at the same time very depressed (laughs). There are so many things in Girls' Work that I couldn't have done, sometimes I would even wonder if it's a good thing for me to step in. I've always been a fan of Hoshizora Meteo, in regards to the fantasy stuff presented, as a gamer, I would be tempted to say "Please hurry up and let me play the completed version!" (laughs). This indeed sounds like something to look forward to. Would you like to talk about your vision for the New Year? Nasu: First of all, my personal ambition for this year is as stated earlier, to finish DDD. It's been a long time since volume 2 was released in August of 2007. When the new year starts, I might spend an extended period of time at home and work on it seriously. As for TYPE-MOON's plan, in the face of a big challenge like Mahoutsukai no Yoru, please succeed. The plan is to release it in the fall, everyone is working very hard on it, please just wait a bit longer.